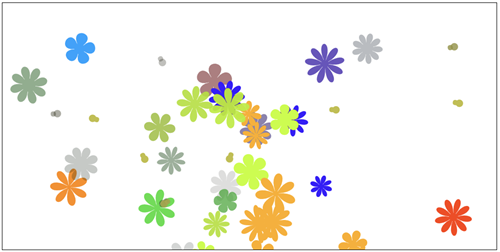 About Sustainable Growth: A simulation you control with code, to investigate the interdependent lives of flowers, bees and birds. Flowers and other plants are fertilized as bees move pollen from flower to flower. Bees eat flower pollen and nectar and make honey. 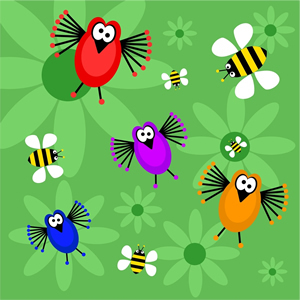 Some birds eat flower seeds and/or bees to survive. Get the Quick Interface Guide. Try it: Can you code a sustainable ecosystem? Click/Run the 7 examples listed below the canvas. Edit them to create your own code versions. Click on Save Code to share your work with others (using the URL created). Click on Save Image to take a snapshot of the Canvas. On laptop: If the canvas does not fit well on your screen, use the Control or Command key and minus (-) or plus (+) to adjust. Credits: By Janette Hughes, George Gadanidis & Chris Yiu. With development, research and outreach support from ORF-RE and SSHRC.